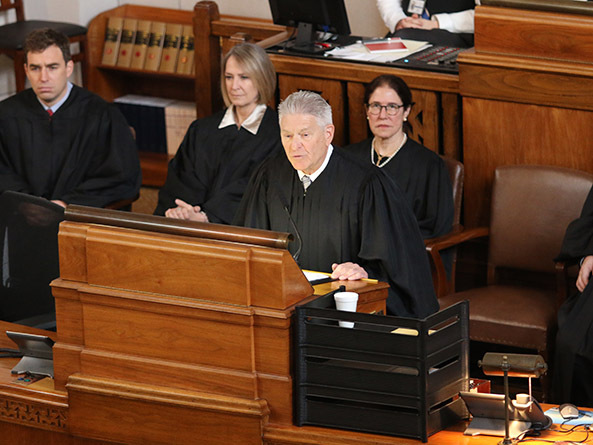 Nebraska Supreme Court Chief Justice Michael Heavican praised the state’s efforts to increase access to justice in his Jan. 17 State of the Judiciary address to the Legislature. Justice reinvestment, which seeks to redirect low-level felons to probationary terms rather than incarceration, has been a collaborative effort between the state’s legislative, executive and judicial branches. Heavican cited the success of problem-solving courts, many of which are drug courts, in reducing the number of incarcerated felons. In 2018, Nebraska’s problem-solving courts served 1,397 people, which represented a 247 percent increase since 2008, he said. Many of those individuals likely would have been housed in the state’s prisons if not for the special court system, Heavican said. Heavican thanked senators for their continued support of justice reinvestment initiatives like problem-solving courts, but said opportunities to serve additional populations have remained unrealized. The chief justice noted that reforming the juvenile justice system, particularly in rural Nebraska, is integral to the success of adult justice reinvestment initiatives. According to Heavican, the judicial branch has prioritized increased access to local foster care, in-home services and additional alternatives to detention, including access to therapy. Improving judicial outreach to Nebraska’s four recognized Native American tribes also is a continuing focus of the state’s court system, he said. According to Heavican, the state supreme court will use public engagement models to improve Native Americans’ trust in the court system, identify disparate treatment of Native Americans, improve judicial awareness of problems faced by members of the community and improve judicial confidence in the state tribal court system. Finally, Heavican highlighted successful modernization efforts to improve access to and efficiency of the court’s online case management system. He noted that 770,000 documents were filed electronically in 2018 in county and district courts. “While many other state judiciaries have found it necessary to purchase new, multi-million dollar systems in order to offer the kinds of tools necessary for modern case management and service to the public, we built our case management system the Nebraska way: in-house, on budget and on time,” Heavican said.